Blog What Is A Concealed Carry Knife? Concealed weapons are weapons, especially handguns, which are kept hidden on one’s person, or under one’s control. This is the legal definition of concealed carry. Some additional definitions are, a firearm or dangerous weapon is concealed if it is carried in such a manner as to not be discernible by the ordinary observation of a passerby. What is a concealed carry knife? Any knife that can be carried in a manner that keeps it concealed. Folding knives are most often placed in the concealed weapon category. I can and do carry sheath knives in a concealed manner as well. I would suggest you find a sheath knife that conceals well on your person as well as a couple well made folding knives to use and train with as well. First we need to look at the definitions and legal aspects of concealed carry. 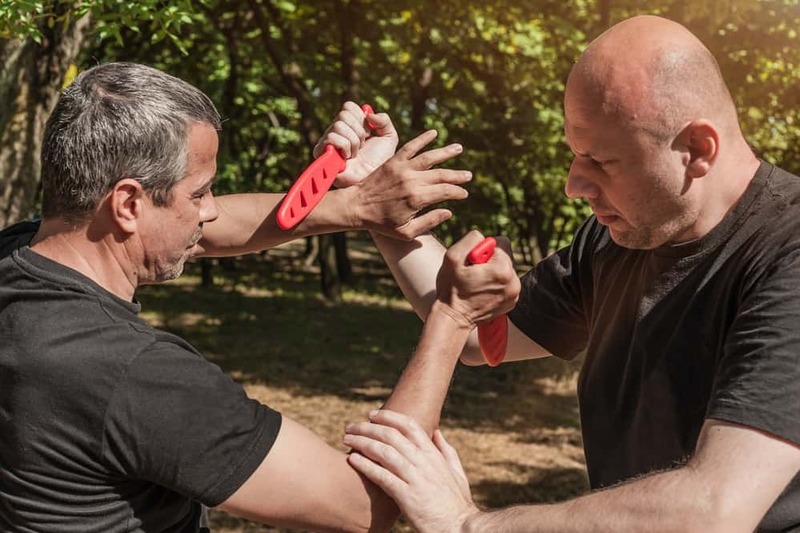 Additionally it should be noted that for slashing knives mentioned the goal of the slash attack is to debilitate and reduce mobility by severing tendons and muscles. Stabbing in appropriate areas is a far better solution for defensive purposes if you have no training or knowledge with regards to areas of attack for slashing. I have never seen non critical cuts, regardless depth, stop a threat. What stops threats is loss of ability to ambulate and rapid exsanguination, or loss of blood rapidly. Concealed carry is something that is under the control of the states or local areas. It is important to understand that concealed carry is not controlled by the federal government. No federal agency issues a concealed carry permit. State and local governments issue concealed carry licenses, so always check your local gun laws to ensure you are legally carrying a concealed weapon. There are dozens of cases of people who had folding knives and or just a magazine being detained, arrested and even imprisoned here in the United States. So be very careful that you check laws and understand them before carrying. For quick reference, there are two sites I use to get updates and information for concealed carry. It is important to understand that laws change daily around the country. After all, politicians only job is taking money from working Americans and making more laws. Additionally, I suggest getting information on individual states case laws and how the law has been applied, defended or used. There are a few states that have a habit of incarcerating individuals who followed the law, simply because of “interpretation”. Here are the sites, USCCA offers a large library of information and lastly, USA Carry also offers a large library, database of information freely available. In the folding knife category there are a few I can recommend from experience and testing, I will link each one in the name. In the affordable category I would start with the Kershaw Grid knife, this one has a 3.7” 8Cr13MoV blade with speed assist, it costs around $30. Next is the Spyderco Byrd Cara Cara 2 folding knife, it has a 3.75” 8Cr13MoV blade that opens easily using the incorporated finger cut. This knife sells for $20 – $30 and is worth the money. Going up in cost we get to the Spyderco Endura 4, with a 3.75” VG-10 blade it retains and edge and has a wicked sharp blade, this blade runs around $75. Next is the Spyderco Paramilitary 2, built with a 3.42” CPM S35Vn steel blade it retains its edge and has a very easy opening build, this knife runs $120. Benchmade makes the next choice, the Griptilian has a 3.45” 154CM steel blade, it is easy opening, solid locking setup and the steel is amazing for holding an edge and offering use across many platforms. This knife runs $100-120 depending on coating and handle material. Now we get to the fixed blade or sheath knife portion. In this arena there are only a few really good options for carry. Again this depends on the person, however, when I carry it has to be truly concealed. Most of my friends and or acquaintances know I carry, however, most of them have no idea what or how many or even when. This should be the goal for anyone who is wanting to conceal carry. First rule of concealed carry, do not tell anyone! Second rule, carry in a way that is concealed and yet accessible for defense. So what are my choices for concealed carry fixed blades/ sheath knives? First I want to recommend the karambit style blade, original karambit was designed to replicate the tigers claw. There are many different sizes of karambit, with its sharply curved blade it offers a tool that excels at slashing and cutting. There are several modern blade designs based on the curving blade that is a karambit. This design is one of the easiest for me to conceal for purposes of defense. It helps to train in escrima, kali or penkat silat. I have and use a few different karambit style blades, when shopping for these make sure you understand what they do and how they work. This will help you get solid versions. Schrade sells a version with a 3” blade that is easy to conceal for $25 or so. The other version that is easy to get and I can recommend is the popular KA-BAR TDI “Law Enforcement” blade, with a few versions available, I have and use this one. It has a 3.75” Aus 8a blade and carries very well with a duty belt or concealed. Other solid sheath blades for concealed carry range from daggers through camp style knives. Anything that can be easily concealed and has a blade length of 3.5” to 5” or so tends to be easiest to conceal and still offers a solid platform for use. One of the designs I like for defensive sheath knifes is the wharncliffe blade shape. Think of standard or drop point blade being reversed, the sharp side being the straight top versus the curved under belly. This design offers several benefits for my personal carry. It lends itself to the flowing approach that is escrima, penkat silat, kali blade fighting and defensive approaches. There are a few that work well for concealed carry. Benchmade Azeria 125 has a 3” N680 steel blade and is similar in shape to the KA-BAR TDI, it costs $80. The other option that I have and use is the CRKT C/K Dragon with a 4.5” 9Cr18 steel blade. While not as easy to conceal as the others on the list it does work well for me. Overall there are a few solid choices for concealed carry knife. It is necessary to remember that knives for defense or offense work best when stabbed. From experience both personal and second hand witnessed, knife is both bloody and difficult for all parties involved. Be smart, be safe! What is most important to remember when seeking any means of defending self in a concealed manner, use these steps. What tool is legally acceptable to be used? Is defense of self allowed legally where you live? What process is needed to legally carry? Is the tool reliable with a proven track record? Is the tool concealable in a manner that is in line with legal and moral needs? Always do the right thing, for some, myself among them, being able to defend oneself is an essential part of our daily journey. For others, blissful ignorance of reality and facts regarding violent crime is a far better place to remain. Here are some facts I have laid out in previous articles. For those who may be still questioning why there is a need to be armed, lets look at some facts, in 28% of all burglaries in home the homeowner is home and 7% of the 3.7 million burglaries that occur every year in the United States the occupant has been attacked violently. (Catalano, 2010) This means that every year 259,000 people in the United States are victimized by violent criminals intent on stealing what is not theirs, or 710 violent attacks in a persons home occur every single day every year in the United States. In 2016, U.S. residents over the age of 12 experienced 5.7 million criminal victimizations. (Criminal Victimization, 2017) This means that every single minute of the year 10 people were victims of a violent criminal act. This is why I carry, why my wife carries and why my children are taught how to defend themselves and what to look for so that if something happens they can avoid permanent injury or death. This is why everyone should be able to defend themselves and willing to do so with the judicious use of force should it become necessary. So what is a concealed carry knife? The answer is, any knife that can be concealed on your person is a concealed carry knife. Some will be far better than others, like firearms some are simply better. A well made fixed blade or sheath knife will in most cases be stronger and faster to deploy than a folding knife. However, a folding knife made well is easier to conceal in many cases. Think smart, be smart and always look at what is needed versus wanted.